John Alfred Prestwich was born in Kensington, London in 1874. His father, William Henry Prestwich, was a photographer and a member of the Royal Photographical Society, although he had previously worked for the Singer Sewing Machine Company in the U.S. and had some mechanical background. He achieved a historical note with his development of silver bromide print paper, a process which he sold to George Eastman (founder of the Eastman Kodak Company) for one thousand pounds. At this time the family moved to Warmington House on Tottenham High Street. John Alfred showed an early aptitude in mechanics and was awarded scholarships at the City and Guilds School and the City of London School; at the age of 16 he started work with the S.Z. de Ferranti electrical apparatus and scientific instruments company. 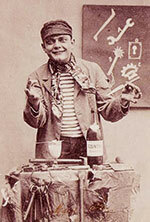 After two years he was articled to a firm of engineers, and in 1895 he started his own business, J.A. Prestwich Ltd., to produce electrical fittings and scientific instruments out of a greenhouse in his father’s garden using only hand tools and a treadle lathe. In 1896 Prestwich teamed up with William Friese Greene to patent and construct a projector with twin vertical lenses, one of many early film devices designed to eliminate the “flicker” between frames by ensuring that there was always an image on the screen. Unfortunately it required a specially designed film and failed to achieve much commercial interest. 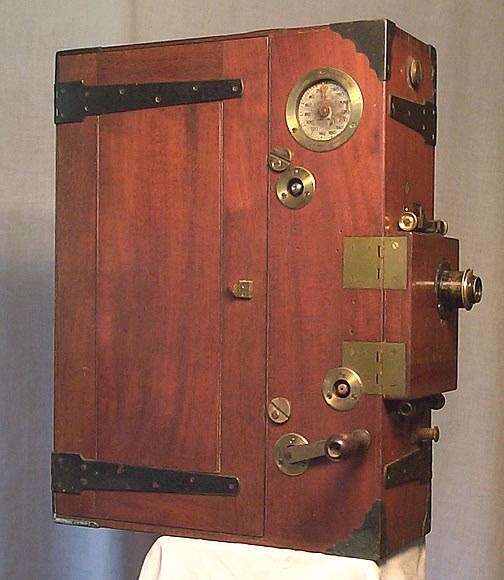 By November 1897 Prestwich was selling the redesigned Moto-Photograph apparatus, which shared the same mechanism as the Duplex machine but was able to utilize the more standard 35mm film. The design was awarded a silver medal at the Glasgow International Photographic Exhibition, in part thanks to his older brother Edward (E.P.) who handled most of the firm’s limited motion picture production. In 1898 John married Elinor Bramley; he bought two properties on Lansdowne Road, Tottenham, to provide the production facilities he needed for the rapidly expanding Prestwich Manufacturing Company. Under John’s guidance the firm was soon engaged in a wide range of engineering products, but in particular he had been studying the development of the internal combustion engine. While working on the cameras and projectors he had applied for a patent based on a design of his own. In 1901 Prestwich began construction on a prototype single-cylinder, four-stroke clip-on engine that was designed to attach to the front down tube of a bicycle frame. The engine came in at 293cc and had an automatic inlet valve; the bore and stroke were 70 x 76mm and it produced 2.25hp at 1,600rpm. It went into some limited production in 1902, and by 1903 one of the company’s first advertisements appeared in the April issue of The Motor. 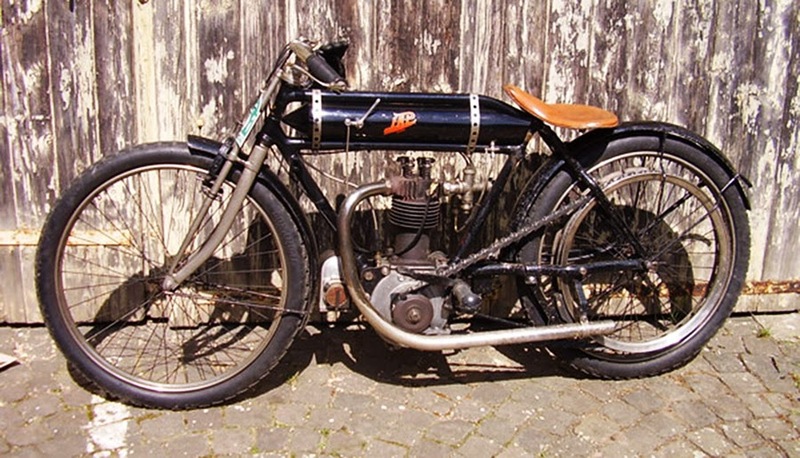 The Triumph Cycle Company had already begun production of a dedicated motorcycle, the ‘No 1’ (1902) designed by Mauritz Shulte using a strengthened bicycle frame with a 2.25bhp single cylinder Belgian Minerva engine. For their 1903 line company founder Seigfried Bettmann and Workshop Manager Charles Hathaway decided to add a new model using the Prestwich engine. Production was increased substantially, and a single cylinder 473cc overhead valve engine designed specifically for mounting vertically in a motorcycle frame soon followed. This new design featured a single pushrod which operated a rocker opening both valves. 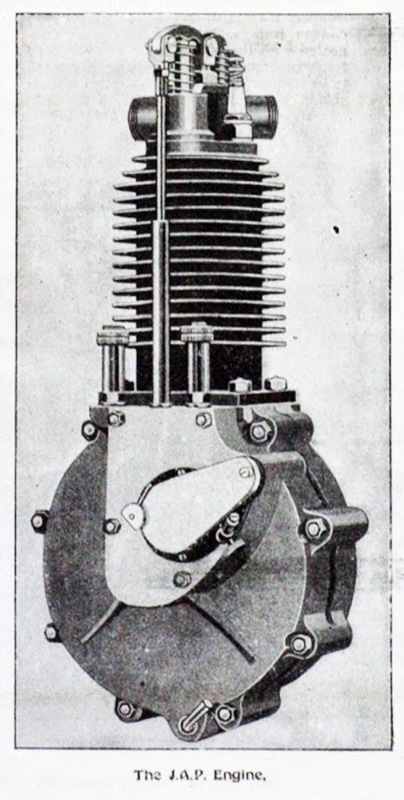 It was the first practical British ohv engine with mechanically operated valves to be made on a production basis. 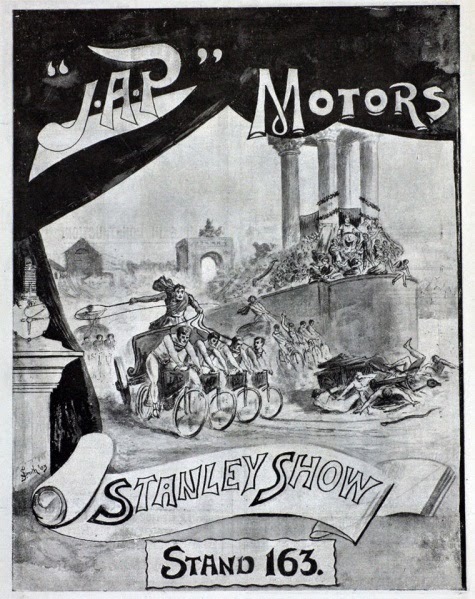 In 1903 JAP premiered their first complete motorcycle at the Stanley Show, using a BSA frame with sprung forks and a vertically mounted 3.5hp ohv engine: there was also a “lightweight” model fitted with a 2.25hp inclined engine. 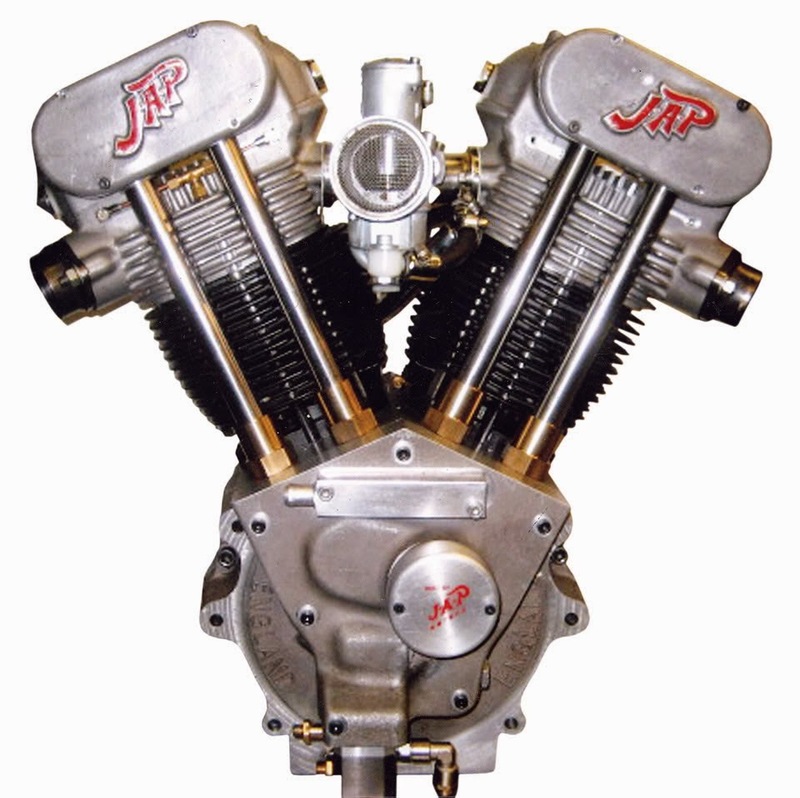 A JAP V-twin engine appeared in 1904. The company also showed an early interest in racing when two machines fitted with 6hp JAP V-twins were entered for the 1905 Isle of Man Selection Trials and the 1906 Austrian international Cup Race. A much larger 2714cc ohv V-twin racing engine was listed in 1908, designed specifically with that year’s IT in mind: water-cooled variants of the earlier singles and twins were also available by that year. The first decade of the 20th century was a heady time for the newly developed motorcycle industry. As the “safety bicycle” had proven to be a winning design in the late 1800’s and had further developed with the advent of small “clip-on” internal combustion engines, many companies were eager to jump into the fray with their own branded machines. These were the real beginnings of the legendary British companies such as Triumph, Norton, BSA and Royal Enfield, as well as their competition across both Europe and North America. Yet while most of them had a strong mechanical background in frame and fork designs, they still lacked the facilities or engineering to design their own engines. JAP had taken care of that aspect in many cases, and Prestwich now made the decision to abandon their own attempts at complete motorcycle production and simply focus on building engines to supply the other marques. The last full JAP motorcycle for many years rolled off the floor in 1908, but engine development and improvement continued unabated. That same year Prestwich also took an interest in the newly established fields of aviation when pioneering pilot and designer Alliott Verdon-Roe used a 6hp JAP V-twin engine to power a biplane of his own design. It was followed in 1910 by a four cylinder JAP-Harding monoplane, which JAP hoped would be the first to cross the English Channel- Bleriot beat them to it when he made his successful attempt on 25th July 1909. 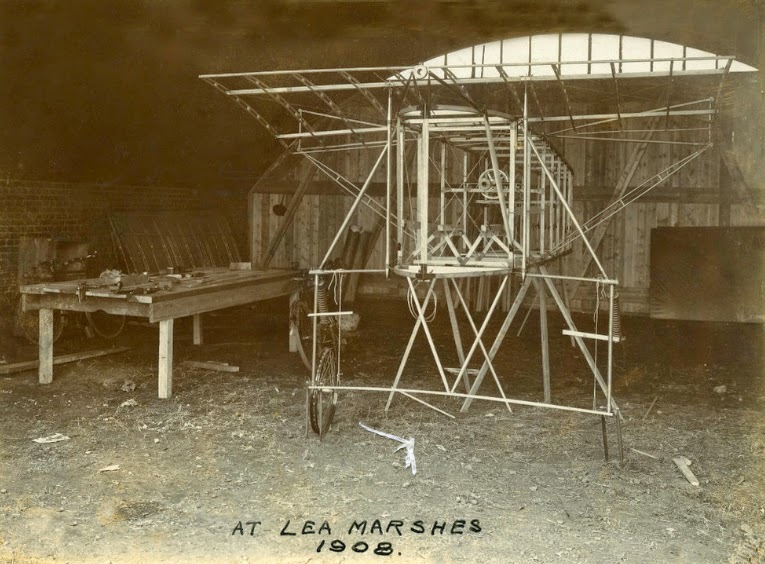 The two machines were very much alike, and there were (unconfirmed) reports from a JAP worker that the aircraft was built using drawings stolen from the Bleriot factory. At any rate, these V4 and V8 cylinder aircraft engines represented the ultimate in JAP engine design. In 1910 a record flight was made from Cardiff to the Crystal Palace by a light airship powered by one of the 4.400cc eight cylinder engines, but the demand for JAP motorcycle engines was still increasing and their increased production had to take precedence once more. The Motor Cycle’s annual Buyer’s Guide of 1910 shows that 20 motorcycle manufacturers already had at least one JAP powered model in their range, a list which by then included Morgan three-wheelers. By 1911 the company had an almost exclusive market in the supply of proprietary engines, and were enjoying a considerable amount of success in competition events: especially at Brooklands where they broke world records. Despite the acquisition of a disused chapel mat adjoined the Lansdowne Road site, production space had become so cramped that in 1911 a larger facility became a necessity. 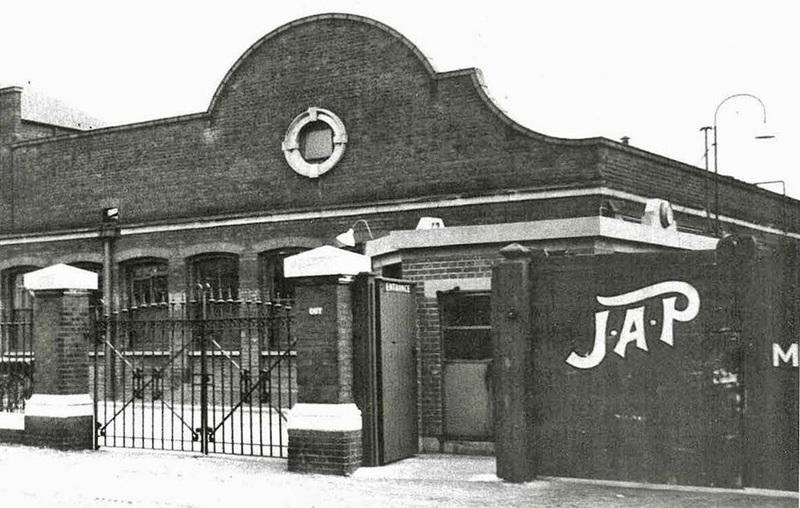 A new purpose-built JAP factory was erected at Northumberland Park, three quarters of a mile away but still within the Borough of Tottenham. With the declaration of war in 1914 the company began producing munitions; they also took on the overhaul and repair of aircraft engines for the Royal Flying Corps. Both the Royal Enfield and Sunbeam military motorcycles were using the JAP V-twin engines, so some engine production continued. 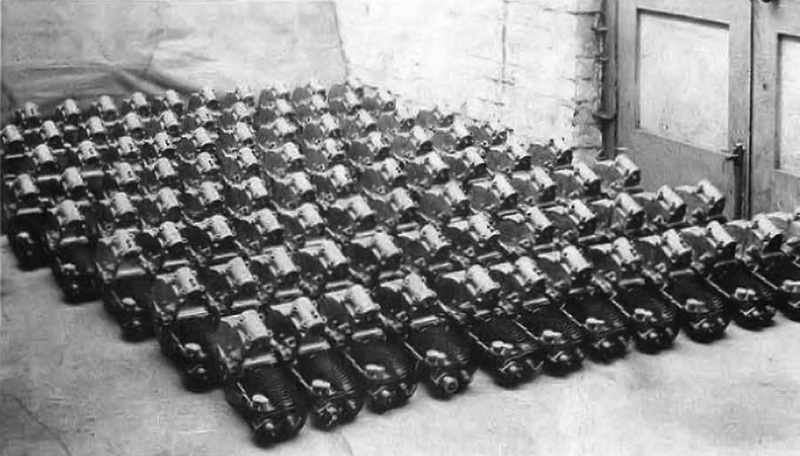 During WWII Prestwich produced around 240,000 industrial petrol engines in support of the war effort, together with millions of aircraft parts, fuses and other components. 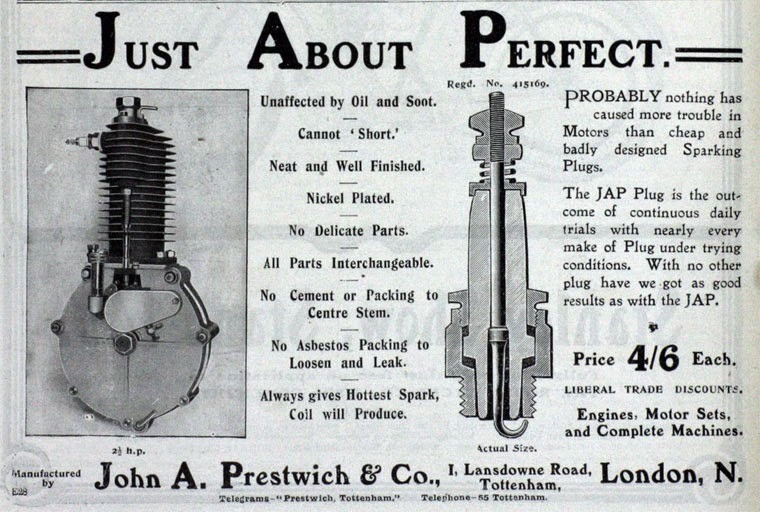 John Prestwich was still tinkering though: in 1918 he was awarded a Silver Medal by the Franklin Institute of America for his invention of the fluid pressure gauge which “permitted an unskilled person to take more than 100 readings a minute to an accuracy of 0.0002 inch”. A year later he was asked to design a machine for painting pencils on a mass production basis; when the company that commissioned him for that went bankrupt in 1920 JAP bought their business and set up a subsidiary company on the Northumberland Park site, placing Roland Prestwich (one of his five sons) in charge. By 1951 the output of Master pencils had risen to a staggering 1.5 million a week, making them the largest pencil manufacturer in Europe. As the manufacture of motorcycles for the civilian market resumed in 1919, Herbert (Bert) Le Vack was taken on as Development Engineer and Val Page rejoined the company as Chief Designer: this unique blend of talent led to the design of a double overhead camshaft racing engine. On October 27, 1922, LeVack made history by lapping Brooklands at 100.29mph on a 980cc Zenith-JAP becoming the first rider of a British machine to reach 100mph. By 1924 JAP held 95 World and British Records, set up by only eleven riders which included Bert Le Vack and Teddy Prestwich, another of John’s sons. Outwardly, 1925 appeared to be the company’s best ever year, but senior management were only too aware that difficult times lay ahead. By this time most of the major manufacturers who had previously relied on Prestwich for their engines had begun producing their own, and the buoyant postwar market in Germany was beginning to shrink as their industry got back into its stride. 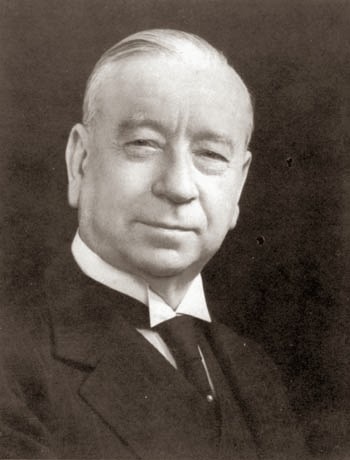 Economics forced the company to drastically;ly reduce the Racing Department by the end of the year; although they left the company on good terms, Val Page and Bert Le Vack had to seek employment elsewhere. Page went on to a very successful career with Ariel, later doing stints with both BSA and Triumph while Le Vack joined Motosacoche in Geneva, Switzerland as the works rider, chief designer and tuner until was killed in the Swiss Alps in 1931 while testing the Motosacoche A50. The company still went into a slow decline; in 1926 they introduced the AlA two-stroke engine in an attempt to appeal to the lightweight end of the motorcycle market, but it was met with little interest. The situation worsened with the onset of the depression of 1928 and it became apparent that diversification into new areas was essential for the survival of the company. Sub-contracts from Ford, Morris, Armstrong-Siddeley and the Bristol Aeroplane Company managed to keep the company solvent while Prestwich turned his attentions towards two new ventures: an outboard engine for speedboats and a high performance engine for speedway racing. 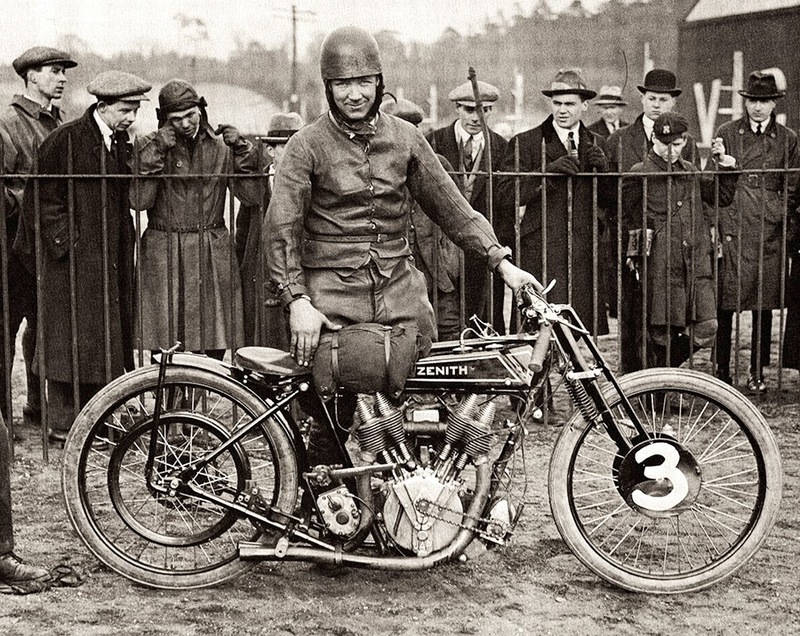 John Vivian Prestwich on a 250cc Diamond with a side-valve JAP engine: Brooklands, Nov 23, 1920. 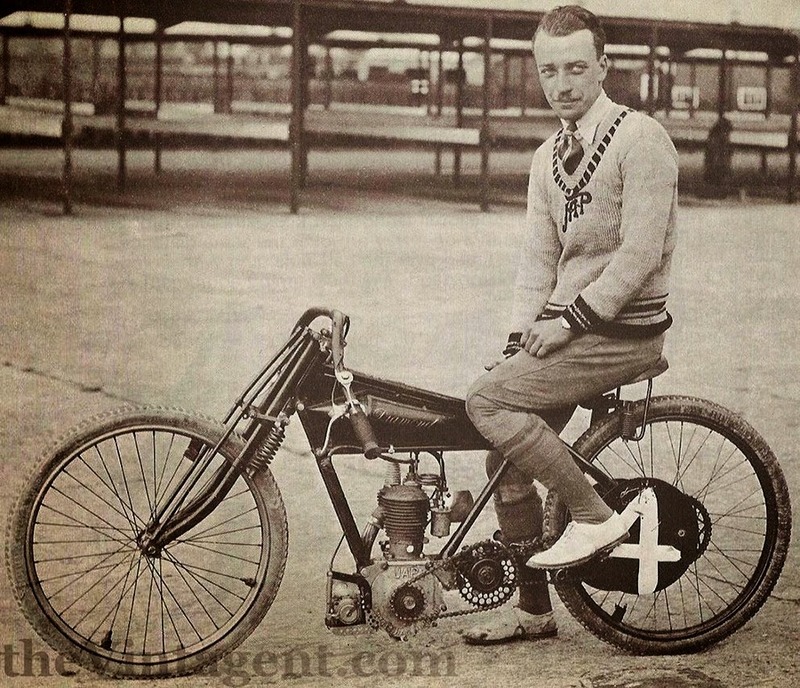 Stan Greening, a longtime member of the JAP experimental department, had encouraged John Prestwich to pay a visit to Stamford Bridge Speedway track; surprisingly he had come away quite unimpressed, believing that speedway was little more than another new craze. But Greening had more faith in the sport’s long-term prospects; the factory’s involvement with speedway racing became the subject for further discussion during the 1929 Motor Cycle Show at Olympia when Bill Bragg, then Captain of the Stamford Bridge team, called at the JAP stand while John Vivian Prestwich was on duty. Vivian realised that perhaps speedway had more to offer than his father had suspected. and with some further persuasion John Prestwich changed his mind and gave the project his blessing. Greening started work along the lines Bragg had indicated and in about three months an experimental engine was delivered to Bill. By 1932 the legendary JAP Speedway engine had become a reality, at the time the world’s most powerful un-supercharged engine of its size and one which dominated the sport for the next 25 years. That year Fergus Anderson picked up an engine which was guaranteed by the factory to produce 37.8 bhp at 5,750 rpm, which he installed in a Grindlay-Peerless machine. In his first lap at Brooklands on April 21st of 1932 Fergus brought the virgin engine across the line at 98 mph. His second lap was 109.22 mph. ; for the hour record with trophy Fergus averaged 100.52 mph. In 1936 the company decided to concentrate on the production of stationary engines for both industrial and agricultural use; they also took on the manufacture of the Aeronca flat twin engine for light aircraft, under license from is parent company in the USA. 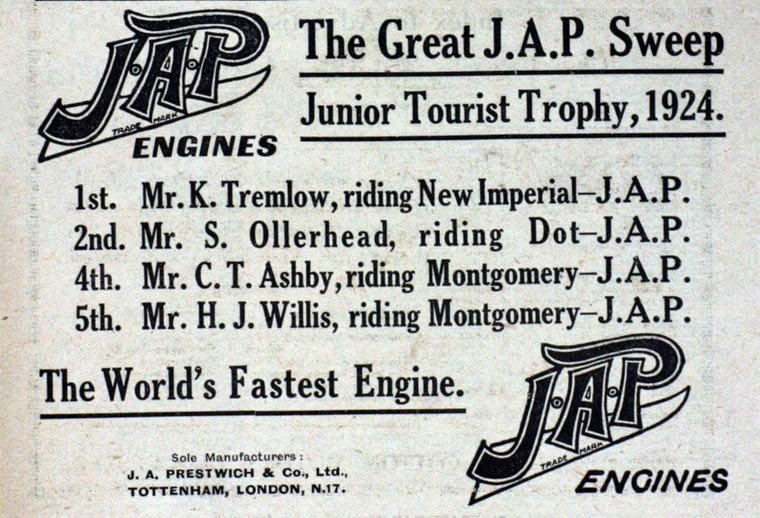 Only a few of the smaller motorcycle manufacturers were now specifying JAP engines, although JAP V-twin engines continued to figure prominently in several successful bids for the World Motorcycle Speed Record throughout the Thirties. 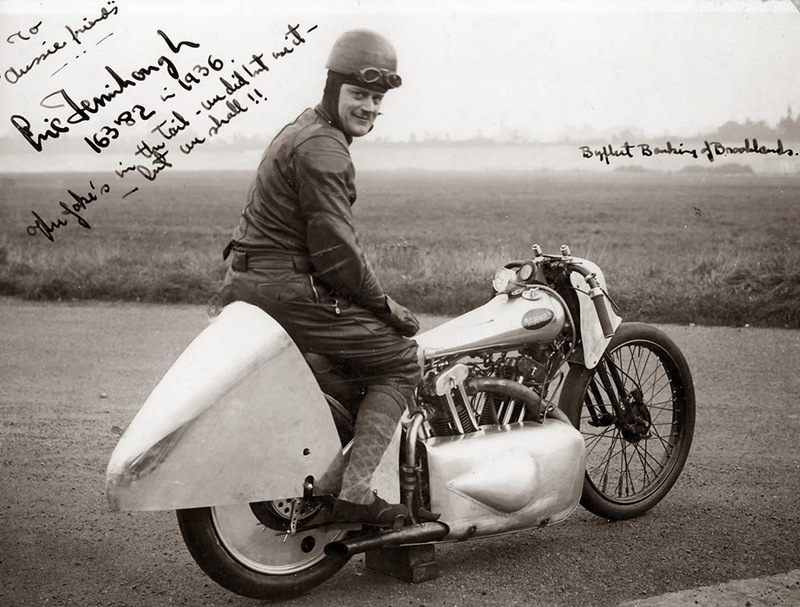 Eric Femihough attempted to regain the World Motorcycle Speed Record for Britain in Hungary during 1938 on a partially streamlined Brough Superior, but sadly it cost him his life when his engine seized. 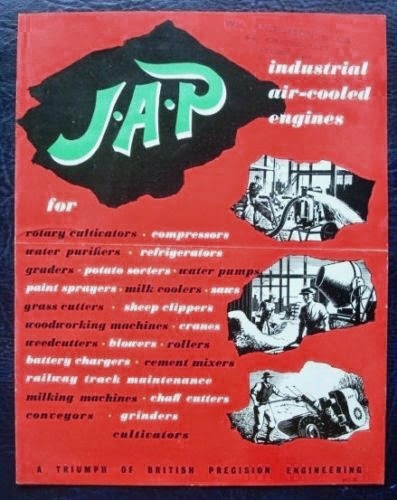 In 1939 the company again found itself making munitions and aircraft parts, and supplying portable generators powered by JAP stationary engines. Their contribution to the war effort was substantial, necessitating the opening of a subsidiary factory in Southgate in 1942. After the war the manufacture of industrial engines remained the core of the company’s business, updated versions of both the speedway and V-twin racing engines being produced only in relatively small numbers. Only AJW showed a passing interest in a JAP vertical twin side valve engine, whilst a new 125cc JAP two-stroke engine still failed to make any impression at all. A new inline 497cc four cylinder engine designed specifically for Formula 3 auto racing was displayed at the 1953 Motor Cycle Show, but despite a flurry of interest it never made it into production . The end came in June 1957 when the company merged its interests with de Villiers Engineering Company of Wolverhampton. The final links with the Prestwich family were severed on 17 September 1957 when the two remaining JAP directors resigned, leading to the closure of the Northumberland Park works on 21 August 1963. In 2009 the Card Family, then owners of the J.A. 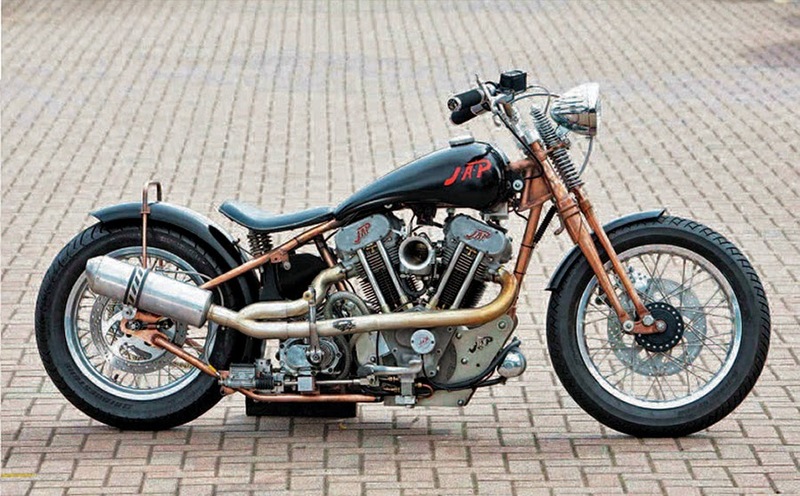 Prestwich Industries Company, began a revival of JAP engines with the release of a new version of the Brough Superior (also under their ownership). 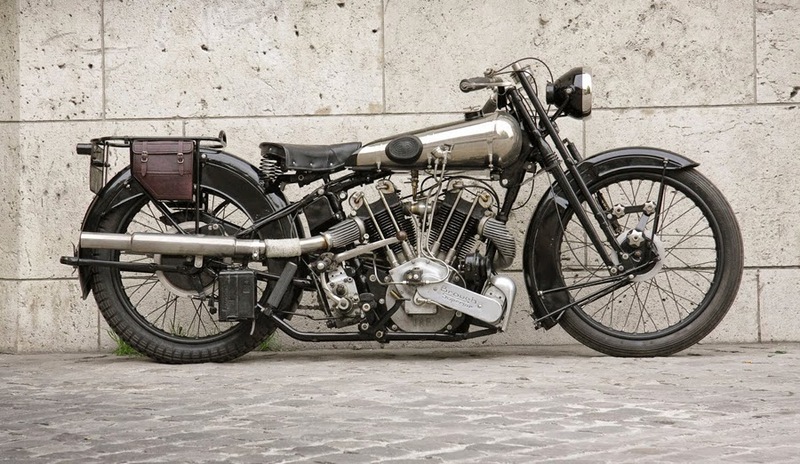 However, the Card family later sold the rights of Brough Superior to Austrian entrepreneur Mark Upham, reportedly to focus on the development of a new twin cylinder 1270cc. engine. Several other companies have expressed interest in bringing the engines into the 21st century, including Lamb Engineering of South Newton, Salisbury (U.K.) who are producing a limited supply of JAP engined motorcycles “limited to 10 maximum a year and produced to the owners requirements” starting at £30K depending on specifications. Cameron Racing, another U.K. Company is also currently manufacturing new engines to spec. 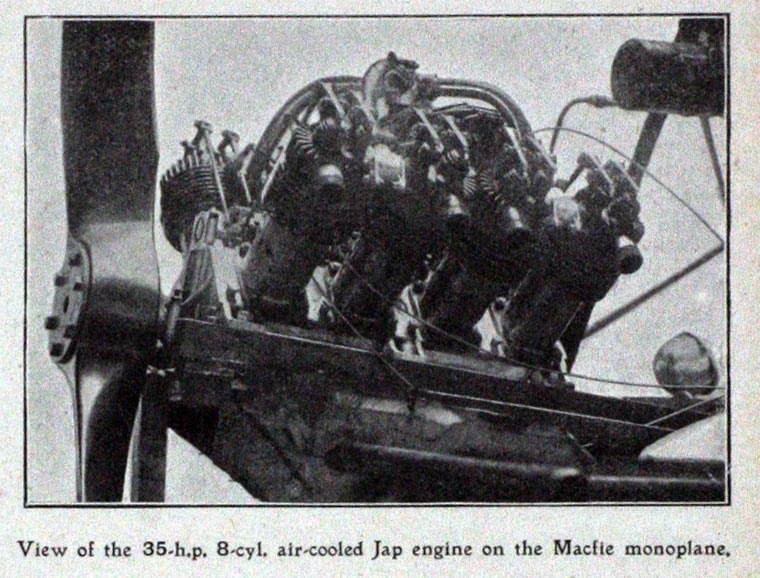 The extensive list of manufacturers which used JAP engines includes Acme, AJW, Aliprandi, Alldays and Onions, Ambassador, Argentre, Ariel, Atala, Atlantis, Atlas, Austral, Automoto, AWD, Bayerland, Bown, Bücker, Brough-Superior, Brown, Calthorpe, Chater-Lea, Clement-Gladiator,Corah, Cotton, Coventry-Eagle, De-De, DMW, Dollar, Dunelt, Eysink, Favor, Fusi, Ganna, Grindlay-Peerless, Hagon, Hazelwood, Hecker, Imperia, Invicta, La Mondiale, Lady, Le Grimpeur, Lea-Francis, Majestic, Matchless, Meray, MGC, Morgan, New Hudson, New Imperial, New Map, Nut, OEC, OK-Supreme, Omega, Onoto, Osa-Liberty, Radior, Rex-Acme, Rover, Rovin, Royal Enfield, Royal Ruby, San Sou Pap, Simoncelli, Soyer, Sparkbrook, Stylson, Terrot, Tornax, Trump, Ultima, UT, Utilia, Verlor, Vindec, Wolf, York and Zenith. 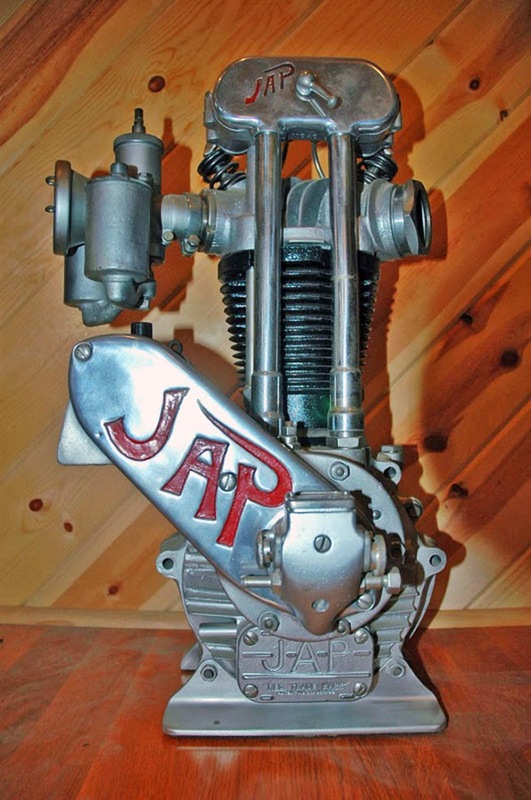 JAP engines were also used in a wide range of industrial and other non-motorcycling applications including lawnmowers, railcars and early Reliant 3-wheelers, as well as farm machinery including the Clifford rotary hoe.